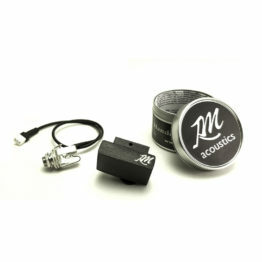 RMacoustics brand new Violin Bridge Dyna-Mic is a patent pending, dual function Microphone System. 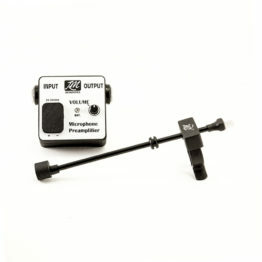 A unique violin clip-on microphone system, that enjoys some of the best pickup’s benefits and captures both air vibrations as well as full instrument’s wood/body vibrations and resonances. 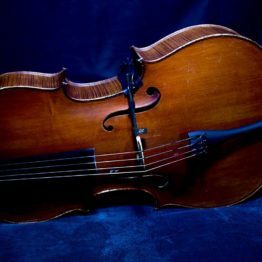 As a result, it can reproduce a clear, well detailed, and remarkably loud, amplified tone that simply is indistinguishable from the instrument’s natural sound. 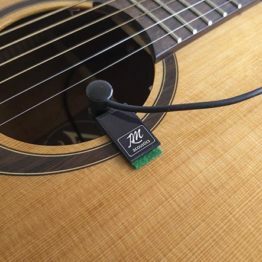 Use it as a stand-alone violin microphone, as a contactless sensor (aka violin pickup) to hear more wood tone of your instrument or simply blend both “air” or “wood”, at any percentage. That is to say, you can have any sound you like from a totally natural tone to a solid, wood tone, with great attack and response. No contact to bridge or soundboard. Clip-on installation in just a couple of seconds. Check out the video/demos tab below. Select between two available interfaces/preamplifiers. 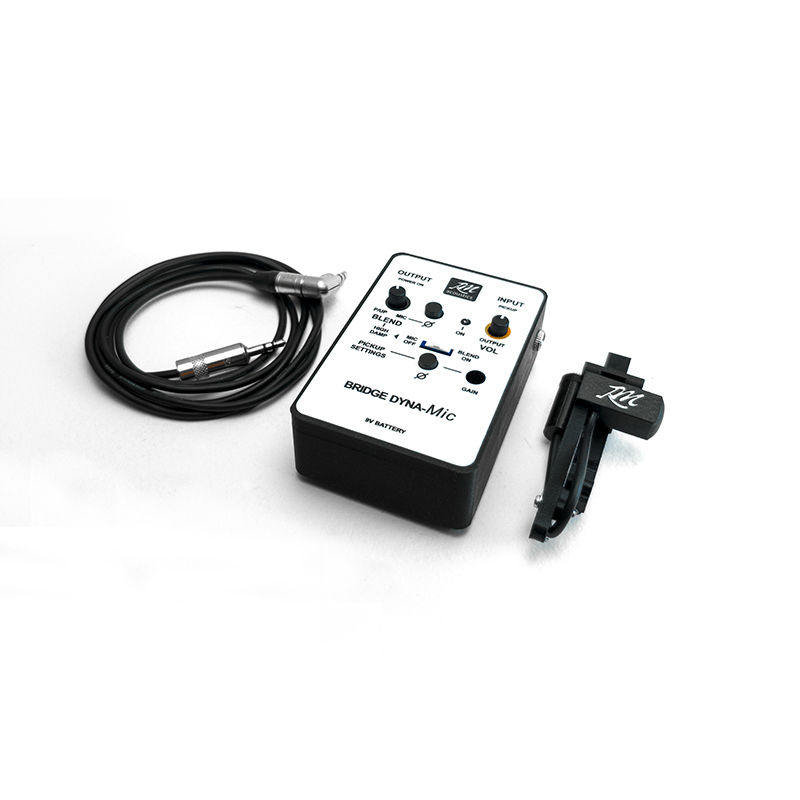 “Bridge Dyna-Mic” (standard) or “Bridge Dyna-Mic XL” to play, even in extremely loud environments/stages, with it’s dedicated anti-feedback and Tone Control circuitry. Usually ships within 1-5 days. If that’s not the case, a notification will be sent accordingly. 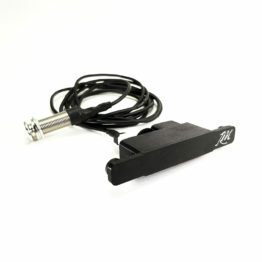 – Violin Bridge Dyna-Mic clip-on microphone system that senses both air and wood vibrations. – Virtually no installation. 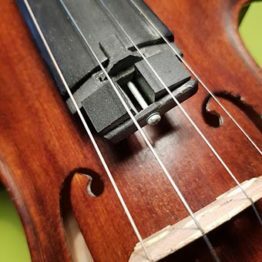 Mounts on violin rib in just a few seconds. – Above all, there is absolutely no contact to bridge or soundboard. 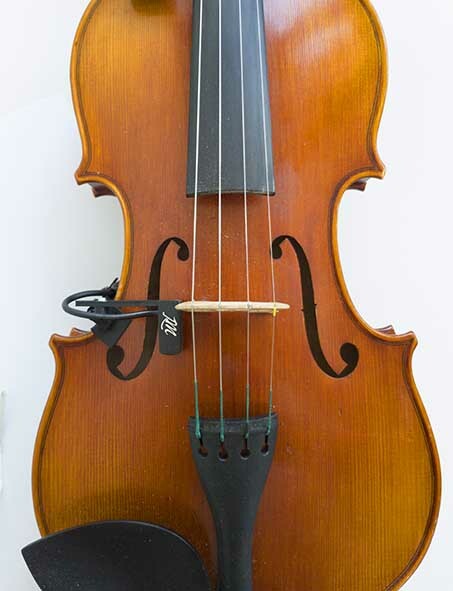 As a result, violin “breaths” naturally and nothing bothers natural sound to make it’s way out of it. Therefore, the system reproduces a clear, detailed, amplified tone that simply is indistinguishable from instrument’s natural sound. – No need for instrument modifications or alterations. 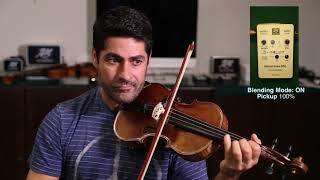 – Violin natural sound unaffected. – Exceptionally feedback resistant in loud environments, so you can play way more loud, than by using a conventional violin microphone. – Adjustable tonal characteristics. From mellow, dark sound with full resonances and rich harmonics to bright more focused sound with less resonance and “cut through mix” characteristics, all with excellent attack and response. 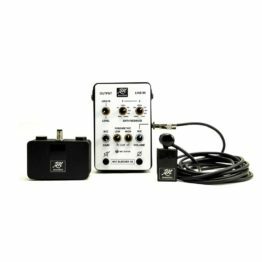 – Variable, adjustable anti-feedback circuit, to use it in extremely loud environments/stages or even notch out disturbing resonances or imperfections of instrument and Tone Control (“Bridge Dyna-Mic XL” only). – Virtually no additional weight on the instrument. 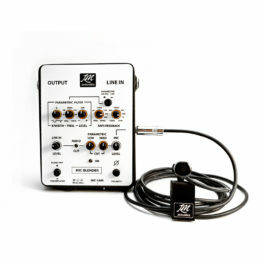 – Easily interchangeable between different instruments. In other words, you can use it with as many instruments as you have. – Blending function available at any percentage. You can blend as much of violin’s “air” or “wood” sound, as you like. – 9V Battery operated (Alkaline). That is to say, you can expect about 60-40 hours continuous operation (Standard interface vs XL interface). – Battery status LED indicator. Sergio Chrissovitsanos introduces the new patent pending, dual function BRIDGE DYNA-Mic. 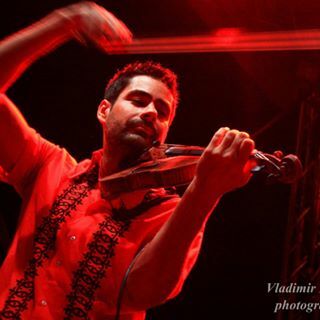 Sergio Chrissovitsanos while testing our Violin Microphone System. 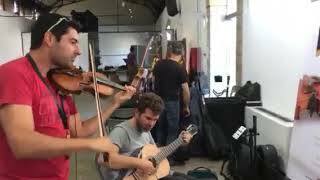 Sergio Chrissovitsanos testing our Violin Clip-on Microphone System. 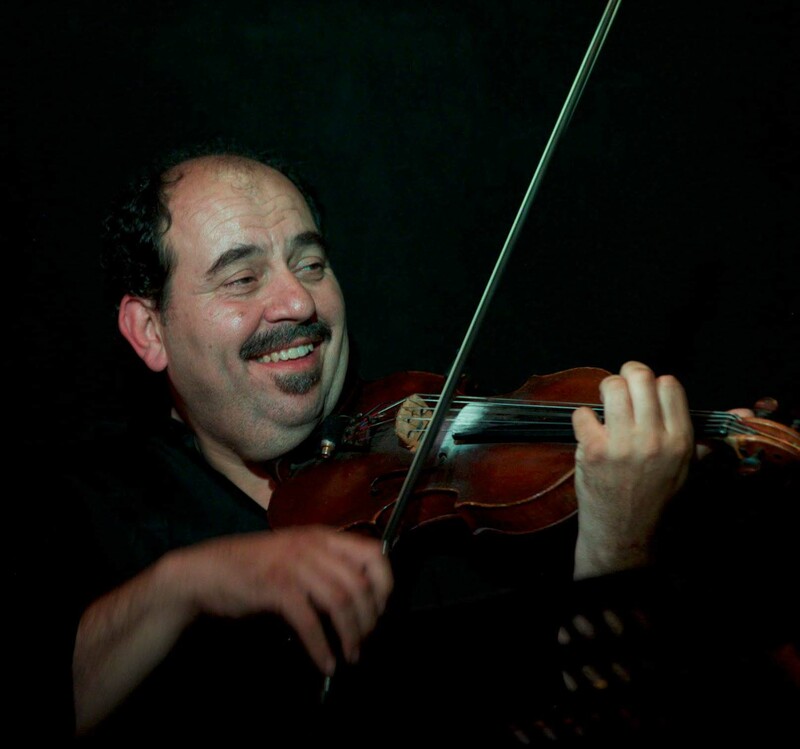 Kyriakos Gouventas using Violin Bridge DynaMic. 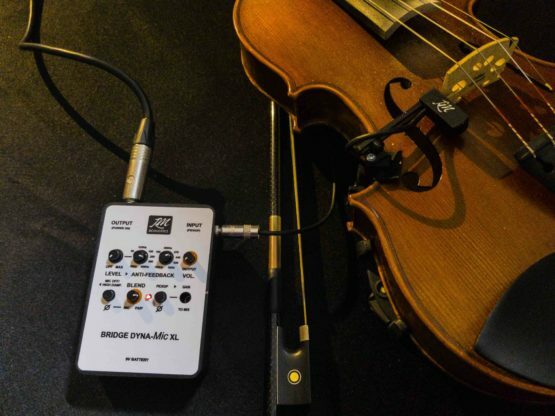 The best violin microphone system I have ever used. Until now, I used to use two sources: A pickup for loud volume and rich harmonics, but no feedback and a microphone for a more natural sound. But I had difficulties in matching or balancing these two different sources with different voicing and of course many extras such as DI-boxes hanging around me. 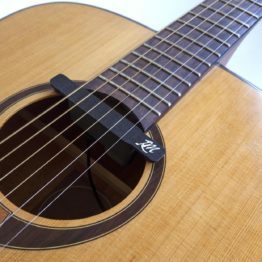 By using RMacoustics Bridge Dynamic, I have both sources in one small piece of equipment and a really great balanced sound. Pickup with ample gain and warm, rich tone, even when playing high pitched notes and of course microphone for a really natural sound. The result is totally astonishing!! Rich, loud, powerful and clean sound even playing in the most difficult stages. Without feedback issues. 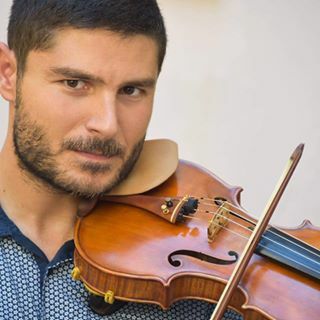 Even more impressive is that the whole system does not touch the violin’s bridge or soundboard, which means that it does not alter the sound of the violin and there is no need for modifications or alterations. The violin stays intact. And it is a real plug & play solution. Anyone can install or remove it, in a matter of few seconds. Well done RMacoustics!!. 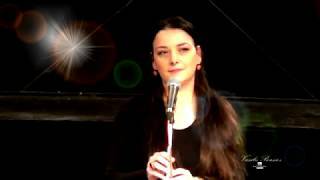 (Click here for more from Sergio and "Gadjo Dilo" band) "Bridge Dyna-Mic" user. A brand new microphone system for violin, an invention by RMacoustics, a combination of a microphone and a pulse sensor near the violin's bridge and soundboard. 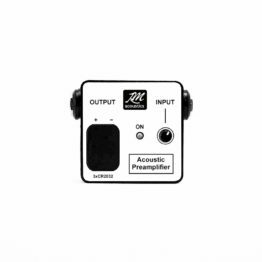 An amplified sound with true fidelity, without distorting or altering the violin's voice when playing high volume, which also integrates tiny adjustments to avoid feedback. It's a microphone system that adapts easily in different on-stage situations and delivers only the best quality that our acoustic sound needs. I strongly recommend it to violinists whose expressive needs are deeply related to their acoustic tone. A real joy for all listeners, I have to notice that it is a "value for money" product, compared to other similar products out in the market. I personally thank Rigas very much, and I admire his unparalleled ingenuity. "Bridge Dyna-Mic XL" user. "I have only one thing to say: By far the best system I ever tried. 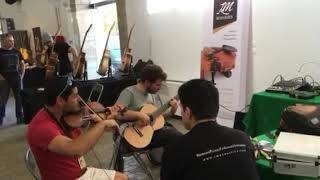 With my instrument and 6 sympathetic strings vibrating under the bridge, it's the ONLY system that produces what the instrument supposed to sound like. It's definitely number one!!" (Find out more for Dr. Koliavassilis here). "Bridge Dyna-Mic" user. 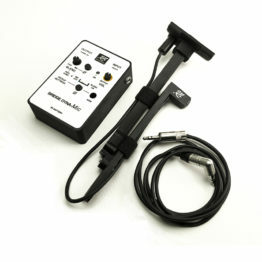 The "Bridge Dyna-Mic" system has solved all my problems concerning the sound of the instrument! 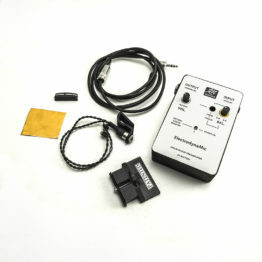 ("Bridge Dyna-Mic" user). Are you a product owner?